Alain Seznec was appointed as Carl A. Kroch University Librarian in 1986 after a long career in teaching and administration at Cornell. Born in Paris, he was educated at the Sorbonne. He first came to Cornell in 1958 as professor of Romance Studies from Harvard University, where he had been an instructor. During his long tenure as a faculty member, Seznec assumed such positions as chairman of the Committee on Residential Colleges, member of Cornell’s Commission on Undergraduate Education, and director of undergraduate studies for the Department of Romance Studies. In September 1969, he was named associate dean of the College of Arts and Sciences and director of Cornell’s six-year Ph.D. program. 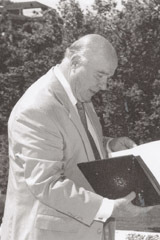 In 1978, Seznec was appointed Dean of the College of Arts and Sciences. During his terms as University Librarian, Seznec oversaw many important developments in the Cornell University Library. Cornell implemented its first online integrated library system in 1986, with the purchase of NOTIS. During his administration, the acquisitions budget rose to more than $7.8 million a year. The Library grew to more than six million volumes. Under his leadership, Cornell constructed the Carl A. Kroch Library in 1990. The underground special collections library opened in 1992, housing the newly formed Division of Rare and Manuscript Collections and the Asia collections. In 1993, the Flower-Sprecher Library of the College of Veterinary Medicine on the second floor of Schurman Hall was expanded into the Veterinary Education Center. During the 1990s, Cornell led in the application of digital imaging technologies to library and archival holdings. The library conducted pioneering studies in this area and contributed to the use of common standards for document capture, storage, and transmission. Seznec retired as University Librarian in 1996.